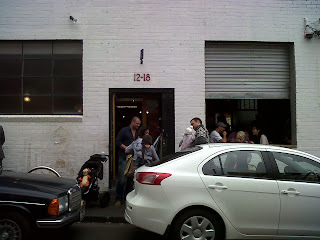 The Frenchman's Food & Wine Blog: St Ali Coffee Roasters, Yarra Place, South Melbourne: the best coffee in Melbourne! St Ali Coffee Roasters, Yarra Place, South Melbourne: the best coffee in Melbourne! After the South Melbourne Markets, I decide that it's time for my morning coffee. Yes it may be 11.30am in Melbourne, but it's 8.30am in Perth, which is just about right!! Located just 5 minutes walk down York Street from the South Melbourne Markets, and conveniently located next to the 112 tram stop on Clarendon Street, this is a true artisanal coffee temple, where the beans are roasted on the premises. Everytime I come to Melbourne, I make it a point to come here for coffee at least once, and of course to stock up on sublimely good, freshly roasted, single estate coffee beans from exotic locales from around the globe. Yarra Place is a tiny little nondescript laneway in a neighbourhood of offices and warehouses, and the street front of St Ali itself is most unassuming. The first clue that you've stumbled on something special is the throng of people spilling out of the place, many of them waiting for a table in this little establishment. And of course, the beguiling aroma of freshly ground and brewed coffee. Or maybe they simply enjoy loitering in a laneway. This place not only makes unbelievably flavoursome coffees, there's also a bustling kitchen which churns out delicious fare. I grab myself 3x 250g bags. Firstly, the St Ali Espresso blend, freshly roasted 3 days ago. Next, the Ethiopian Yirgacheffe, roasted a week earlier (I wanted to see how it compared to the Yirgacheffe-2 variant offered by Tartine), and certainly not least nor last, the Nicaraguan Cup of Excellence Lot 13 La Bendicion. The latter, at $27 a bag, is even more expensive than my $25 bag of monkey-picked coffee beans! But the friendly but no-nonsense boss lady with the curly dark hair thought it was the duck's proverbials, so I certainly had to try it for myself!! I even got a special bonus. After asking Boss-Lady for her recommendation on load sizes for Miss Silvia, she called over Aaron the barista to provide some advice. Aaron kindly provided not one, but three valuable coffee tips for the aspiring home barista. Coffee Tip #1: Aaron opined that a double-shot filter basket is the way to go. The problem with the single espresso basket, he explained, is deep in the middle but gets too shallow towards the edge, and this results in an uneven distribution of water. The double-espresso basket, on the other hand, is of even depth all across. Coffee Tip #2: run 40 mls through the coffee, to extract the best flavor. Coffee Tip #3: tamping is merely to create a seal between the coffee grounds and the inside edge of the filter basket, and it's unnecessary to use too much pressure. What a bonus! Boss-lady was even impressed that I had Miss Silvia! I'll tell you how I'm enjoying my coffees shortly.